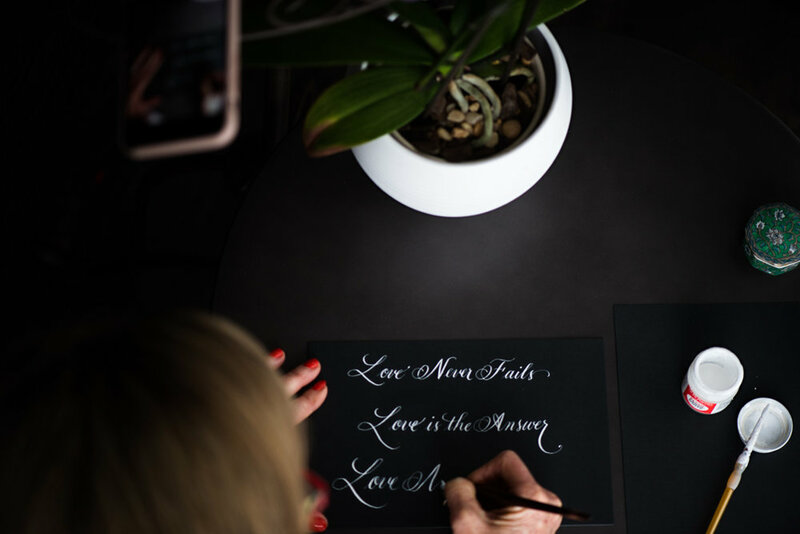 Dede is not only extremely skilled at calligraphy, but is also so approachable, kind and responsive. I came to her needing my wedding invitation envelopes addressed in a rush. She was so helpful and told me she would have it done as fast as possible. She lets you choose the color of ink as well as which font/style you like. She recommended a beautiful style for my envelopes. When I did receive the finished envelopes, they actually took my breath away. They are stunningly beautiful and I will be coming back to get my place cards done soon. Instead of getting things printed, I highly recommend Dede's calligraphy. Both you and your guests will be blown away by the quality of her work! Dede Adams is a true artist! I loved working with her to create our wedding invitations. We now have something that is truly unique and her calligraphy received many compliments. She was an important and integral part of our wedding and I would recommend her to anyone!